Travelled to Tromso, inside the Arctic circle, in Northern Norway. Three nights and a two day meeting left just time for a pre-breakfast walk and a mad evening dash to chase the northern lights. 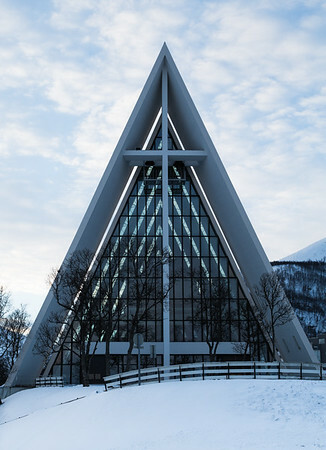 Tromso cathedral provides a stark modern contrast to some of the more traditional buildings in the town. Some photos of my March 2014 trip up into the Arctic Circle and Tromso can now be found under 'Travel the world. Arctic - Tromso'.